← I Voted! Now What? Just as it seemed I was back on the exercise wagon…it got really stinkin’ cold. Now, I realize one’s definition of “cold” depends upon where you grew up, how extensive your winter wardrobe is, and whether or not you are a man. But I think it’s COLD! And more relevant to this blog post, I think it’s too cold to exercise outside after dark. I have found a few things that help to keep me headed to the gym, even on winter days like we’ve had recently. TIP 1: Set a long term exercise goal. To keep me motivated, I set a goal to run the Broad Street 10 miler or a half-marathon in the spring. I’m goal-oriented so this helps me stay motivated on days when I’d rather go straight to bed after work (every day). TIP 2: Commit to manageable, realistic exercise goals. I know that if I promise myself I’ll exercise every single day, I will soon run out of steam. I do know that I can swing three days a week; even if that means walking to work once, doing a short exercise video at home, or biking on the weekends. If I keep the exercise goals within limits, chances are that I won’t burn out or disappoint myself, and I might even exercise more than four times a week. TIP 3: Join a gym. For budget-conscious Penn students and staff (like me) consider joining the Fox Fitness Center. For staff, it’s $180 for the year (versus $378 for Pottruck); this prices out to be about $15 a month–a huge steal! Though Fox Fitness Center does not have a pool or locker rooms, it does offer exercise machines and free weights. Best of all, it’s never crowded. Check it out here. 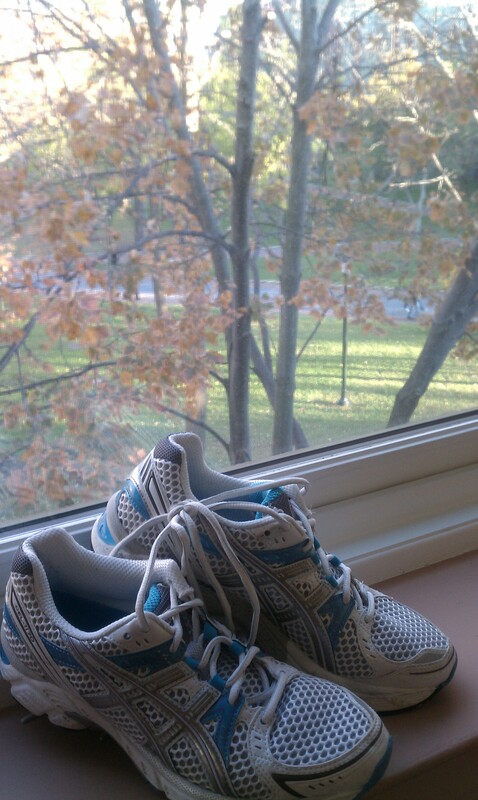 …Purchasing these new work-out shoes, shown here against the backdrop of the autumnal view of Locust Walk. I will not be posting before and after photos of my physique, but let’s just say, I’m cautiously optimistic about my chances of exercising three days a week this winter. You should join me! Filed under Alumni Perspective, Athletics, Lillian G.